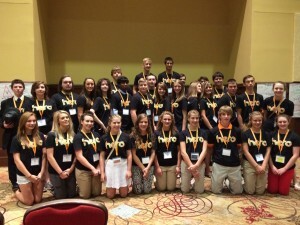 MORGANTOWN, W.VA. – Nearly 40 students completed the College Foundation of West Virginia (CFWV) Youth Summit held this week in Morgantown. The Youth Summit was part of West Virginia’s annual Student Success Summit, an event that brought together education administrators, teachers, students, military leaders and community group members to focus on collaborating to promote lifelong success for the State’s students. Tenth and 11th graders from Berkeley Springs, Elkins, John Marshall, Philip Barbour and Point Pleasant high schools participated in the Youth Summit, which offered a variety of workshops to develop their leadership skills. The Youth Summit focused on helping students understand the issue of college access, or the need to increase the number of students from disadvantaged backgrounds who pursue and complete some form of postsecondary education. Over the course of the next year, students who participated in the Youth Summit will work within their respective schools to launch and lead “Higher Education Readiness Officers” (HEROs) groups. The groups will be responsible for building and strengthening a college-going culture within their schools and communities. The HEROs program was first created through the West Virginia Higher Education Policy Commission’s (Commission’s) federally funded “Gaining Early Awareness and Readiness for Undergraduate Programs” (GEAR UP) initiative. The effort has been recognized nationally as a best practice in promoting college access and success. The Youth Summit and the expanded HEROs initiative are sponsored by CFWV, a collaborative effort led by the Commission in conjunction with the West Virginia Council for Community and Technical College Education, the West Virginia Department of Education and the West Virginia Department of Education and the Arts. CFWV focuses on assisting students of all ages and backgrounds in preparing for and succeeding in education and training beyond high school.